I recently came across a great idea by a blogger going by the name of Cadianshock to give away Black Library books. Essentially, the idea is that if you are the lucky recipient of a free book once you have read it you should also give it away for free. As an English teacher, this idea of sharing books really appealed to me and so I was very honoured to be the first recipient of a Cadian Shock Library book. In keeping with the rules of the project, I too will be giving away the book to the first person who replies to this post expressing an interest. I will post the book, free of charge, to anywhere in the UK. If you are overseas get in touch and I will look into how much postage will cost you. Full rules can be found here. Fifteen Hours is the debut Black Library novel by writer Mitchel Scanlon. The book is a tale of a young farm boy who finds himself conscripted to the Imperial Guard and leaves his quiet, peaceful world to confront the horrors of the grim dark universe that is the forty first millennium. I must say, I have always been a fan of the Imperial Guard and one of my earliest 40k armies was the metal Cadian Shock Troops (sadly, long-since thrown away). It is a point frequently made (although no less true for that), that the guardsmen are perhaps the most relatable inhabitants of the 40k canon as they are normal humans struggling to survive in a hostile universe with little more than their training, faith in the Emperor and trusty lasgun. Scanlon really plays on this and the protagonist, Arvin Larn, is a very likeable character. He is essentially a naïve, Luke Skywalker-type character who leaves a simple farm life and finds himself plunged into a larger and more dangerous universe. The book is well-written and fast paced and the plot rattles along nicely, following Larn’s home life, training and deployment. As one would expect from a Black Library novel, it is full of action but, where the novel really shines, is the dark humour running through the narrative. This really showcases the uncaring bureaucracy of the Imperium and Larn is sent to the wrong warzone because of an administrative error. This element of the story reminds me of the fantastic film, Brazil by Terry Gilliam and its one of the elements that sets the book apart from the standard military SF novel. The training section of the novel is the weakest part and is full of clichés such as the angry, insult-hurling drill sergeant and is essentially Full Metal Jacket in space. However, once the novel moves beyond this it really improves and I found myself gripped by the action and hoping things would work out well for Larn (although the opening of the novel hints at his eventual fate). Overall, this is a nice little novel and, while unlikely to blow you away, will keep you entertained for a few hours. If you’re interested in reading this book, drop me a comment below and I will post it out to the first person who replies. 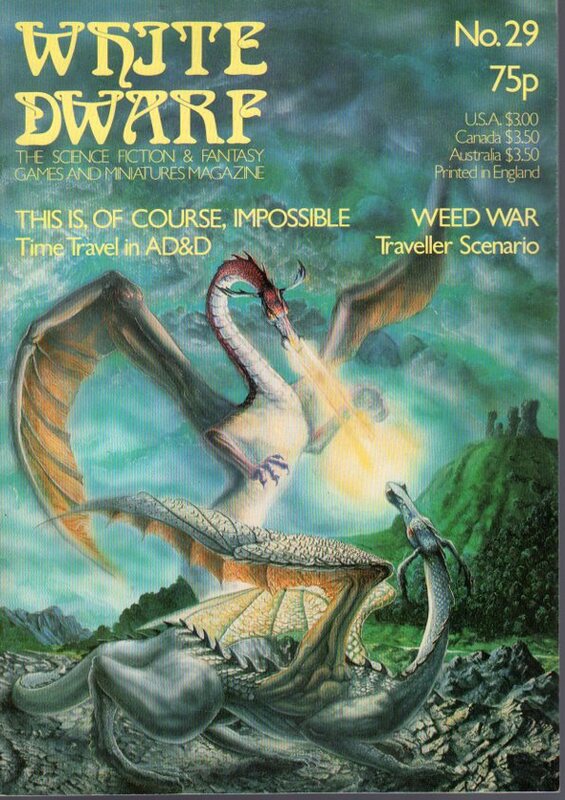 Like many wargamers I still fondly remember the first issue of White Dwarf magazine I ever bought. It was issue 190 way back in 1995 when I was just 11 years old. The magazine introduced me to brand-new worlds, from the dark and inhospitable future of the 41st Millennium to the industrial nightmare of the Underhive to the more familiar fantasy territory of Warhammer Fantasy Battle. It also came with a free miniature (a plastic ganger for Game-Workshop’s newly-released Necromunda game) which helped kick-start my collection of Citadel miniatures which has grown ever since. 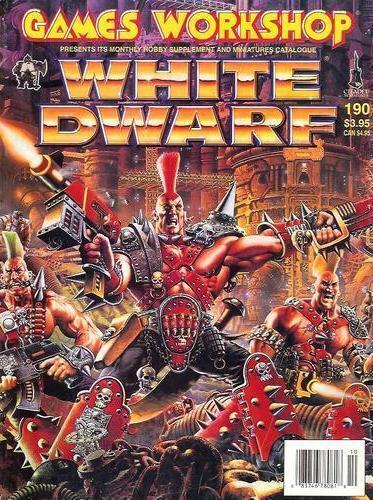 Since that day I have been an avid reader of the magazine and have bought almost every copy of White Dwarf published between then and now. In that time many editors have come and gone and many changes have been made to the magazine. However, perhaps none of those changes can compare to the complete overhaul that the magazine has seen with the release of the latest issue. So, what’s changed and, perhaps more crucially, it it a change for the better or worse? The first thing to notice is the production values of the magazine. The magazine is weightier and printed on nice, thick paper. The whole magazine looks and feels much more lavish than before. The cover is fantastic as well, combining a very modern, clean look with a pleasingly retro logo. The matte and gloss effect of the cover is also very nice. However, what I really like about the cover is the use of a photograph of a model as the cover image rather than the painted artworks we are used to seeing. Not that I have anything against the studio artists (and many of the covers were fantastic) but the new issue places the models were they belong, at the forefront of the magazine. After all, as Jervis Johnson points out in his column this issue, ‘ours is primarily a collecting hobby’ and ‘the act of collecting miniatures comes first’. The clean modern look is continued throughout the issue. Models are nicely photographed, often against red backgrounds which is very distinctive and looks great. This really showcases the models to their best advantage. The ‘New Releases’ section features some fold-out pages which just seemed a bit gimmicky and these were hard to read unless sitting at a table. 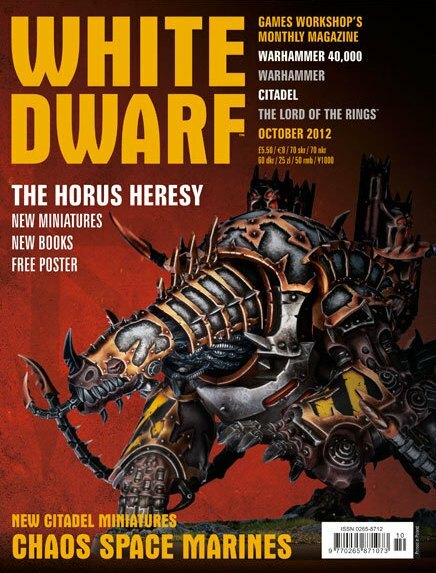 Is the new logo a nod to the classic White Dwarf logo of years gone by? However, the changes to the magazine are not merely superficial, the content has changed significantly as well and this issue heralds the beginning of what promise to be regular features. One of the things that I really liked about these was the renewed emphasis on painting and modelling that these articles introduce. We have ‘Army of the Month’, ‘Parade Ground’, ‘Kit Bash’ and ‘Battle Ground’ all of which focus on the painting and modelling aspects of the hobby. There is also a great feature called ‘Paint Splatter’ (perhaps not the best title for a painting article as presumably ‘paint splatter’ is what you want to avoid when painting models…) which covers techniques for painting the models found across the rest of the magazine. For example, the ‘Army of the Month’ this month is Ben Johnson’s Skaven and ‘Paint Splatter’ tells you how he went about painting his army. 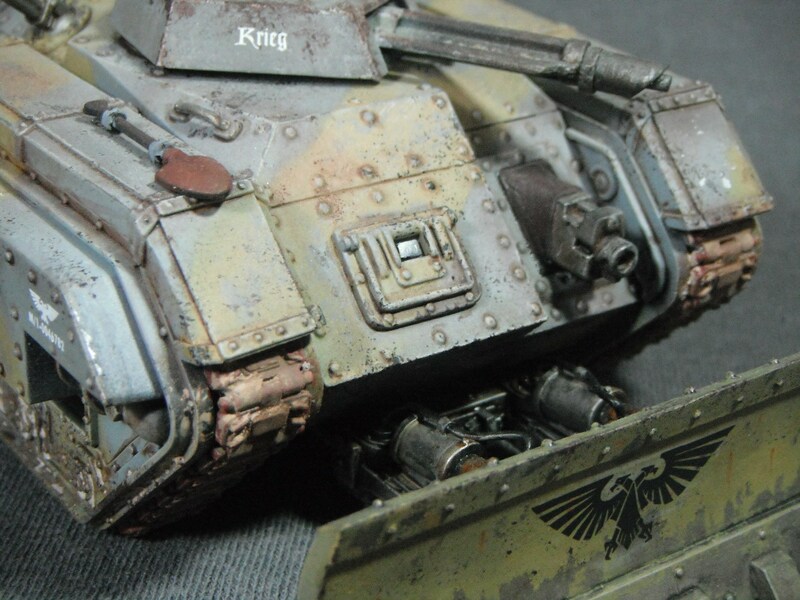 Similarly, the article covers techniques used for painting many of the new Horus Heresy models that are seen throughout the issue. In fact there seems to be a real attempt to establish such connections across different articles in the magazine which I really like. This issue also sees the return of the designers’ notes which have been lacking in recent issues. These take the form of an article by Codex: Chaos Space Marines author Phil Kelly along with another by Jes Goodwin who designed much of the new range of models. Both of these articles are illustrated by plenty of concept art for the new models. I have always liked these features in White Dwarf as, in many ways, they are like the DVD extras of the hobby, letting you see behind the scenes. Personally, I find these glimpses into the design process fascinating and it’s always nice to find out why the designers did something a certain way and what their inspirations were. Battle Reports are still a feature of the magazine and the new format is very clear and easy to follow. However, I don’t really have much else to add about this as they are not drastically different from what we are used to. The only article I didn’t really like was another new regular feature ‘The Rivals’ (and no, in case you were wondering, it hasn’t got anything to do with the eighteenth-century play of the same name). In this article, the blurb tells us, ‘we take two highly skilled players and pit them against one another in a head-to-head tactical debate about both their armies’. Essentially the article begins well with both players discussing what they usually take in their respective armies and why along with a discussion of the tactics they use. So far so good. However, where the article falls down is in the next section where the players go head-to-head and discuss who would win in a battle. This seems to be nothing more than random speculation of the sort that you can all-too-easily find on the internet and the rationale for including this in the magazine is a little vague. The players do eventually fight a battle to see who is proven right but this isn’t really covered in detail and is relegated to a few lines at the end of the piece. This article might have been better had it had a stronger rationale, such as two players coming up with very different builds/tactics for the same army which would give it a stronger focus. Overall I was very impressed by this issue and the new direction that the magazine seems to be heading in. The focus on painting and modelling is something that really appeals to me although I am aware of the fact that some readers would prefer more articles about rules and tactics, however, we may see more articles like this in the future. It’s hard to judge from reading just one issue. What I really liked about this issue, though, was that it has some real content. The articles were, for the most part, interesting and engaging and had a lot more depth to them than a lot of the articles that we have seen in recent issues. It took me longer to read this issue than previous ones (which largely seemed to involve lots of pictures and little in the way of text) and it will definitely stand up to rereading. I also like the repeated calls throughout the magazine for readers’ submissions (this even goes as far as suggesting that there is ‘a tenth member of the White Dwarf team … and that’s you, the reader!’). This was always an enjoyable feature of earlier White Dwarfs and I am glad to see it make a comeback. It would be great to see the readers get more involved in the magazine. 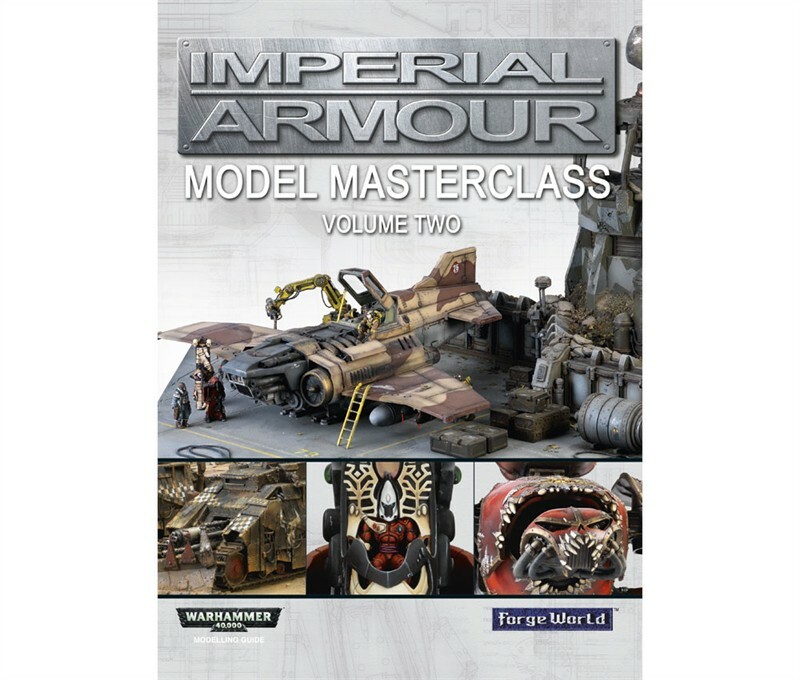 Way back in 2008 Forge World released Imperial Armour: Model Masterclass Volume 1, a guide to painting Forge World’s own range of models. Shortly after the book was published I picked up a copy from a GW store and I can honestly say that it changed the way in which I paint models. Before then I often followed the guides published in White Dwarf and painted exclusively in a style similar to the ‘Eavy Metal team (a style I still return to). However, upon reading the first installment of Model Masterclass I was inspired to try out new things and approach painting with the kind of gritty realism seen in the book. Since buying the book it has been a constant source of reference and I even applied the techniques from the book to army painting with my Death Guard army. The first thing to note is that, like all of Forge World’s publications, this is an extremely well produced book. It is a large hardback with thick glossy pages and is a thing of beauty in itself. The book follows the same format as its predecessor and contains a number of detailed step-by-step guides to painting individual models along with showcases of finished models with shorter explanations of how key areas were painted. There are also some great modelling and terrain building guides for constructing battlefields and dioramas. The guides are very clearly written and should prove easy to follow. There is also a handy guide to using weathering powders in the back which elaborates on some of the techniques used in the rest of the book. 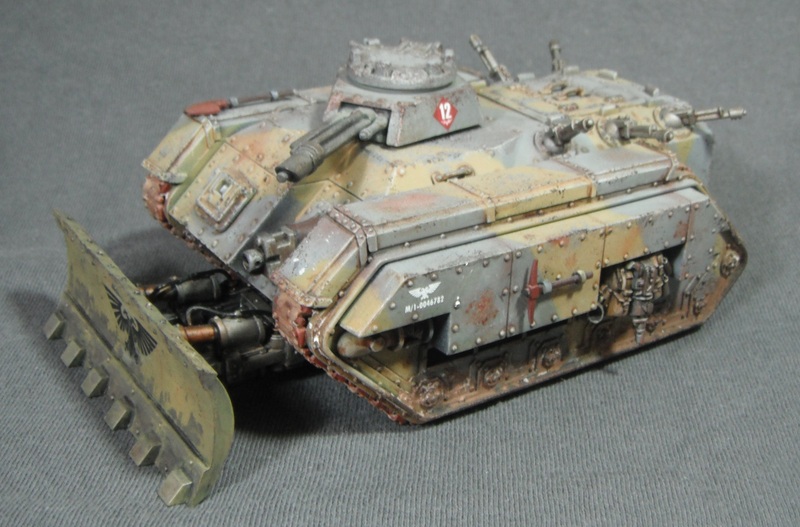 Personally I was very pleased with this as I have had a bit of trouble using weathering powders in the past and so hopefully this will prove useful. Once again it is the forces of the Imperium that are in the spotlight (as you may have guessed from the title) but their alien adversaries also receive plenty of attention throughout the book. There are a couple of the shorter guides on painting Eldar vehicles and a section on an ork diorama which showcase very different techniques to those employed on imperial vehicles. It’s just a shame that there isn’t a slightly more detailed guide to painting Eldar vehicles but then the basic techniques seem to be similar to the Brass Scorpion of Khorne which does get the step-by-step treatment. One interesting thing about the Eldar guides is the way in which the models are airbrushed using light greys and flesh colours (in the case of Saim Hann) or using black and white (Mymeara) in order to establish the basic patterns and highlights. The models are then given several translucent coats of paint in order to tint the basecoat and build up the colour of the vehicle. This is a very different way of painting to anything I’ve tried before and I’m looking forward to giving it a go. One surprising thing about the book is the fact that all of the guides refer to the old paint range. While this shouldn’t be a great problem given that the conversion chart from White Dwarf should make it simple to choose similar colours, it seems odd that after the much-hyped launch of the new paint range they should release a book based on the old paints. 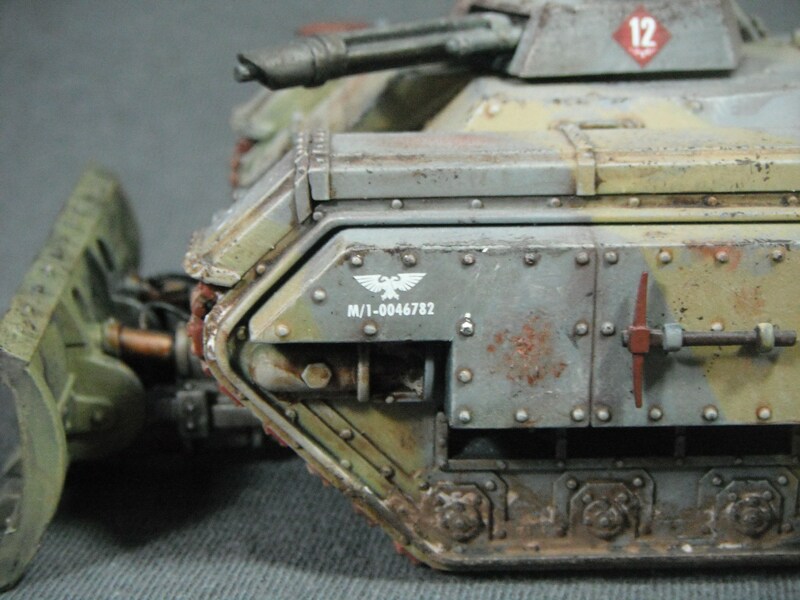 Then again, the book also makes use of a lot of non-GW paints which I found interesting. I think it is good that the writers are using whatever paints they feel will get the best results rather than simply pushing the Citadel range. This gives the advice in the book a much greater sense of objectivity. A couple of other things I feel I should point out for people who may be considering buying the book are the skill levels involved and the equipment required. As with the previous volume, a lot of the material in the book assumes certain level of painting expertise. This book certainly isn’t for beginners (something like the new How to Paint Citadel Miniatures might be more helpful if you are just starting out). Also, if you don’t have an airbrush it may be of limited use to you (although there are some techniques which do not require one). However, as I mentioned above, this really is a beautiful volume filled with gorgeous photos of amazingly painted models (Phil Stutinskas’s Red Scorpions and the ‘Encounter at the Balmaeus Ice Mines’ really stand out in this respect) and, at £26, it might be worth having just for the pictures. I’m certainly looking forward to trying out some of the guides. I’ll keep you posted when I do. 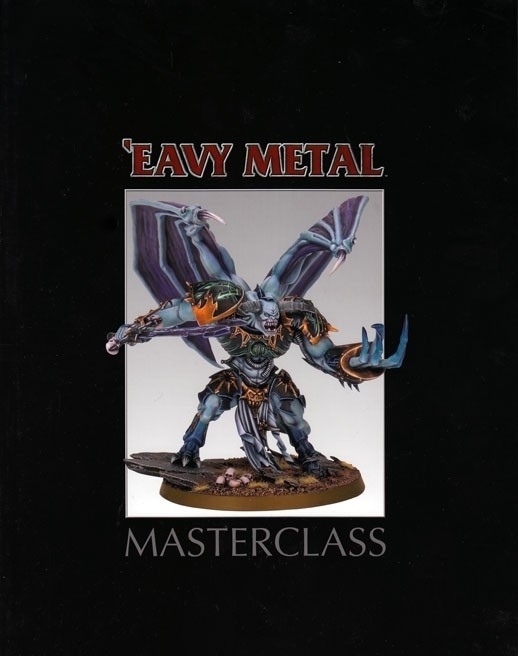 For Christmas I received a copy of ‘Eavy Metal Masterclass. I was very pleased with this as the Masterclass articles are my favourite part of White Dwarf. The book collects together twelve previously published articles along with a new painting guide for Urien Rakarth which is exclusive to the book. The book is very nicely produced and features loads of brilliantly painted models by the ‘Eavy Metal team. The articles are very clearly set out and the set-by-step guides are easy to follow. Although the guides focus on individual models, proving a start-to-finish painting guide, the techniques could easily be applied to other models. 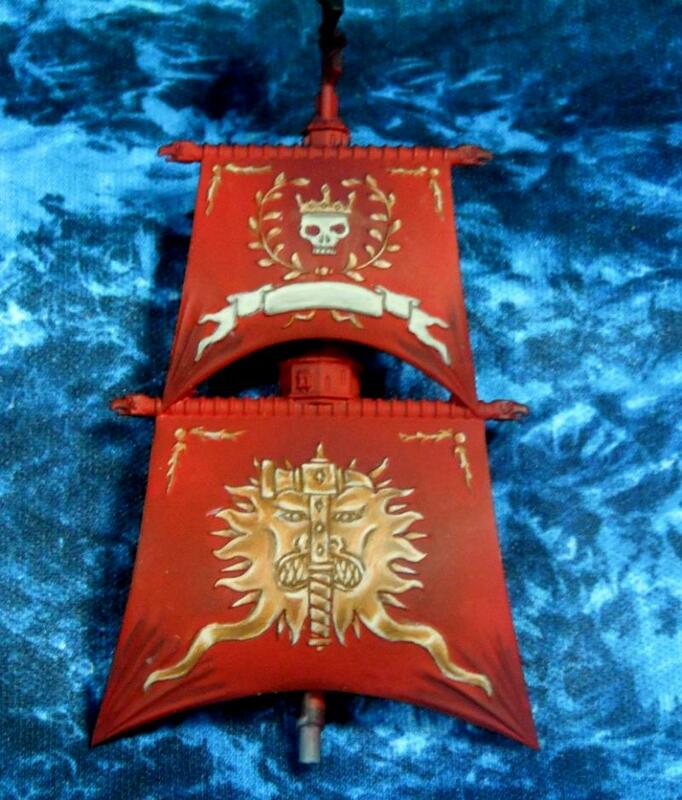 For example, I applied the NMM gold technique from Darren Latham’s Sanguinor painting guide to the detail on the Heldenhammer’s sails. This was only my second attempt at NMM and I found the Masterclass very useful. One of the great things about the Masterclass articles is that they have encouraged me to try techniques I’ve never tried before and step out of my comfort zone. I believe that this has definitely made me a better painter. The guides in the book are all based on the ‘Eavy Metal team’s in-house style. I would say that the guides are intermediate and expert in difficulty and the techniques employed are quite time-consuming. The book is really aimed at more experienced painters aiming to produce impressive display pieces. If you want quick and easy techniques for army painting or are new to miniature painting then this may not be the book for you. The only real downside to the book is that the vast majority of material has been previously published. If, like me, you haven’t got all of the issues of White Dwarf in which these articles appeared or would like to have them collected together in a single volume then this is a great purchase. However, if you have the articles already you might think twice about getting the book.